It’s funny how whenever I’m writing something God tends to try me on my own ideas. “Oh, more joy, less stress? Let’s see how far you believe that.” Because, seriously, looking at December and all the things that could possibly show up on my calendar is stressful. I know my inclination to say “yes” at every turn and I really don’t want to do that. I want the joy, not the stress. Intentional time being and not just doing. I want peace and joy and laughter and smiles and contentment this Christmas…for me and my family. I want to be present. So the world and it’s spinning has been tempting this week and I’m trying to turn my face away to better things. To not just show up to every activity, but to be engaged at a heart level, an eye-seeing-eye connection. You? So…while we’re diving into examining our Christmas traditions and what we want our priority to be this Christmas season all the while giving up the stress and embracing the joy, I wanted to share with you some of our Christmas favorites. 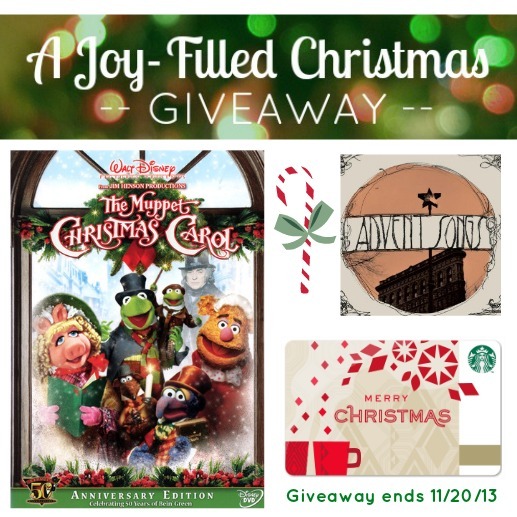 The Muppet Christmas Carol – A favorite, kid-friendly Christmas movie. My husband grew up watching this and introduced me to it our first Christmas together. We’ve been singing “It’s in the singing of a street corner choir…” ever since. Advent Songs by Sojourn – If you’re not listening to Sojourn, you’re really missing out. Seriously. Theologically rich songs, beautiful, lyrical music. Starbucks Giftcard – Peppermint Mocha. Red cups. Need I say more? It’s a Christmas necessity people. Growing up my parents would pick a night to drive around looking for Christmas lights. We never knew what night it would be…they would put us to bed and then a few minutes later yell, “surprise!” and we would get to drive around in our pj’s. We usually stopped at DQ afterwards for blizzards. 🙂 My husband and I have started doing a similar tradition with our kids and it is so much fun! That is an awesome tradition! I’ve never heard of it before, but how fun for both kids and parents! It’s cool that you carried it forward to your kids. I love buying Christmas pajamas for my boys to wear on Christmas eve. So many memories….making tons of cookies to share with family nod friends. Decorating the house and a certain young lady making sure the lights on the tree were just so, driving around and seeing the lights with friends kids in the back of a truck and coming home to their Marine fathers making hot chocolate from scratch on the stove. Candy cane lane walks and Starbucks peppermint mochas! Slow down and cherish all the memories you are making! BTW, Mom is not entering the give away. Just sharing memories…. world differently. When she was 15 months old we were decorating for Christmas. We had all the lights on the tree and we stepped back and said come look at the pretty lights on the tree. Sam, in her own special way, laid down under the tree to look at the lights from the bottom up and inside out. From that day on, whenever we have the lights on the tree we lay down under the tree and enjoy the lights from her way of enjoying the Christmas tree lights. My favorite growing up was looking at Christmas lights. With my family now I enjoy packing OCC shoeboxes with my kids and Christmas dinner with my family. We were generally broke when I was a kid. It was the 70’s, my mome was a single mom with three kids…you get the picture. But I remember going to get out tree on Christmas Eve because they were always cheaper :). We would walk home…because in Brooklyn, it was normal to not drive or have a car 🙂 and it was difficult to carry a tree onto the bus! On the way we sometimes stopped to get hot chocolate and sometimes we stopped at a private home of the Guarino family because they had over the top decorations…moving, lights blinking, Santa on the eve handing out coloring books and those cheap wax crayons…it is a childhood memory I cherish! my favorite christmas tradition is we change the house while my daughter sleeps putting up additional decorations and covering the table in cookies and pies. also we always leave a few unwrapped presents under the tree. I grew up watching that too! My favorite part of the holiday season is making traditions with the kids. My favorite tradition so far is, putting up the tree the day after Thanksgiving, and then going to a store where the kids can each pick out a brand new ornament to add to the collection. going to buy the Christmas tree at the store. My favorite Christmas tradition is baking spritz cookies using my grandmothers cookie press. My favorite Christmas tradition growing up and now with my own little family was watching 24 hours of a Christmas Story and dinners with my family. For the past 6 years or so my family (parents, brothers and sisters) started celebrating our Christmas as a family on December 27, instead of the 25. This way we can join our spouse’s family on Christmas day and not have to alternate every year our try to juggle both families on the same day. It’s great too because by the 27 all the Christmas goodies have been clearanced…So we have a very abundant Christmas celebration when my family finally gathers! It’s wonderful! My favorite tradition as a child/teen was planning surprises with my sister for our parents. As an adult, Christmas has changed so there aren’t many traditions kept anymore, but one thing I’ve enjoyed for the past several years has been to find time in the middle of Christmas afternoon to slip away from the family and just have a few quiet moments reflecting on Christ and what his birth has meant for my life. I love Christmas!! My favorite tradition is reading “The Advent Book” with my kids (by Jack and Kathy Stockman). The art work is amazing and each day has a door that the kids open and then a scripture that tells the story. By the time we get to Christmas day, my kids are quoting scripture, because they have been reading the story every single day. Yep, LOVE it! We always go to a local farm at night where we get on a hayride and view a really beautiful Christmas light display. The kids really love cuddling up under a blanket when they’re on the hayride and getting hot chocolate afterwards.